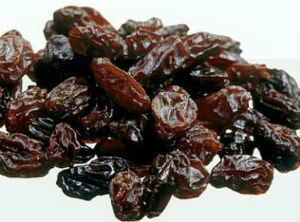 Raisin is a dried grape, which is grown in many countries in the world. They are made by dehydrating grapes in a process using the heat of the sun or a mechanical process of oven drying. Raisins have high content of "sugars", around 72% by weight. But most of the "sugar" is fructose and glucose. They also contain about 3% protein and 3.7%-6.8% dietary fibre. Raisins also have high content of some antioxidants. Raisins are usually eaten raw, and are ideal snack. They are also used in cooking, baking and brewing.